I love a good Earl Grey, I cannot lie. I received this bag of The Earl’s Garden as part of a Christmas present and I’ve been happily sipping it ever since (spoiler alert: I will probably get more). What I love about the classic Earl Grey is the good black tea base with the fresh citrus scent of the bergamot. The Earl’s Garden does not disappoint with the strong citrus aroma that is laced with strawberries. The Earl’s Garden consists of: organic black tea, marigold petals, strawberry, cornflower petals, natural strawberry & bergamot flavouring. I like that I can see and/or smell all of the ingredients. The strong bergamot and strawberry aromas are almost intoxicating because they’re that strong, it really does make me more eager for a cup! 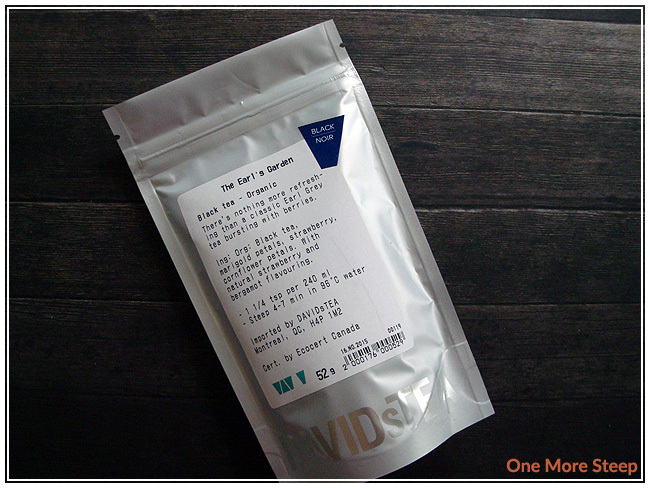 DavidsTea recommends steeping The Earl’s Garden in 96°C (204°F) water for 4-7 minutes. I steeped my pot of The Earl’s Garden for about 5 minutes. The Earl’s Garden steeps to a clear reddish brown that has a very subtle strawberry aroma to it. The fragrance of strawberries overpowers the bergamot, which is a bit surprising considerin the fact that bergamot is often the starring ingredient in an Earl Grey. First sips of a cup of this tea does not disappoint though. 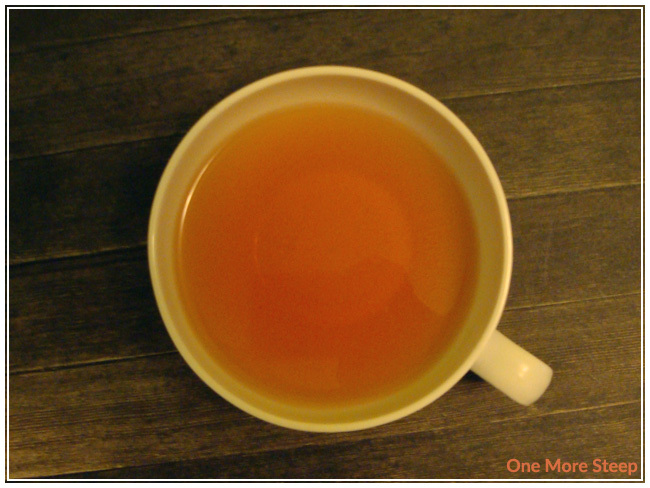 The citrus taste of the bergamot mingles very well with the subdued strawberry taste in the steeped tea. There’s just a touch of sweetness to the tea that makes the berry flavour come out even more. The black tea base is fairly similar to the other Earl Grey-inspired teas I’ve had from DavidsTea – no bitterness for the amount of time I steeped it for, and it tastes like a strong black tea base. What really sets this tea apart is the strawberry and bergamot combination. Just a mild sweetness that would be good for anyone wanting a little treat. I did add a bit of sweetener (white sugar, for those curious) to my tea and it does brighten up the flavour a lot by bringing out more of the strawberry taste. I tried resteeping The Earl’s Garden and it sadly didn’t work out. The tea was weak and the magical strawberry and bergamot combination was sorely lacking. This tea is a one time trip to The Earl’s Garden and doesn’t hold up for one more steep. I loved DavidsTea’s The Earl’s Garden. I’m a sucker for Earl Grey in general, and the strawberry addition just works for this tea. 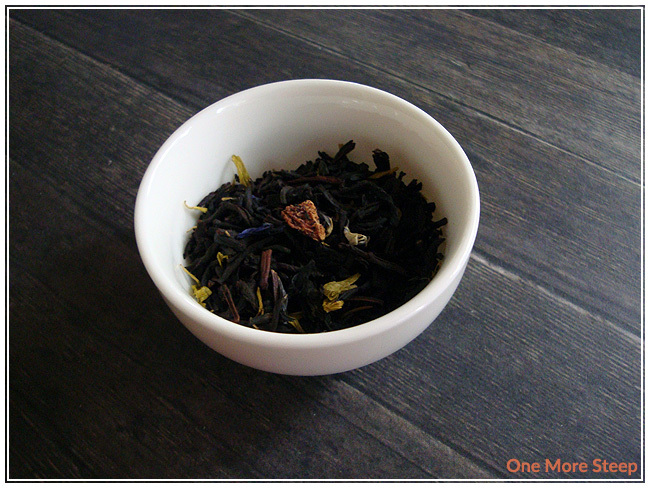 The mild sweetness of the strawberry in the steeped tea really makes the tea stand out from other Earl Grey-inspired teas. I do think I will continue to add a sweetener to this tea though, as that does make the flavours pop out more for me. It is a nice change from the classic Earl Grey, which I still love, and it can definitely be doctored up with sugar and cream. Did you know that this tea has been discontinued? I have been waiting a month for some at my local store. They had no idea it was discontinued so I had no advance notice. It is my absolute favourite and I have several cups a day. I only found out the sad truth by contacting head office. They said they saying goodbye to an old friend to make way for a new one. Not how I treat my old friends! That’s so unfortunate! I didn’t realize that DavidsTea had decided to discontinue this one! I have also been drinking this tea for a couple of years and am so disappointed that they have discontinued it! It was the best tea I’ve ever drank. I wish I could have been given notice so that I could buy 10 tins. My favorite tea of all time. Still quite upset that it’s gone. Maybe if we bug them enough they’ll bring it back!